Upon arrival, tour guide and driver of S Vietnam Travel will welcome you. Tour briefing and transfer to your hotel. Tour briefing and transfer to your hotel. Enjoy walking tour around Hoan Kiem lake and the Old Quarter of Hanoi. In the evening, the guide will take you on a culinary adventure, sampling street food in the Old Quarter. It’s a great opportunity to try all those weird and wonderful foods you see but just aren’t sure what they are! Start your Hanoi Street “Eats Tour” at Bia Hoi corner to try the local brew, a draft beer that traces its roots to Eastern Europe. In the morning, you have a half day city tour with some main attractions of Hanoi, including Ho Chi Minh complex (Ho Chi Minh’s mausoleum and stilt house); the Temple of Literature, and one of the city’s museum (Women Museum). In the afternoon, you will go to Bat Trang - one of most famous traditional village in the North of Vietnam. The people of Bat Trang are famous for their ceramics. This is where Hanoians come to buy their pottery. It takes you about 30 minute drive to Bat Trang. Once there, you will walk through the village, visiting different homes and observing the ceramic production process. This tour is ideal for those people who are interested in craft and artwork and wish to take a unique souvenir of Vietnam home with them. Enjoy an early morning swim (during the summer), followed by breakfast as you cruise through more spectacular scenery. The cruise arrives at the harbor by noon. The driver will pick you up and then transfer directly to the airport for flight to Saigon. Pick up and transfer to your hotel. Check in and free time. This morning, you will visit the famous Cu Chi tunnels, an incredible underground tunnel network constructed by Vietnamese resistance fighters during the long struggle for independence. The network included innumerable trap doors, specially constructed living areas, storage facilities, weapons factories, field hospitals, command centers and kitchens. This morning, you will transfer to the airport for your short flight to Siem Reap. Upon arrival, Siem Reap orientation, walking along the Siem Reap Riverside, and visit the Fruit-bat in front of the Residence of King. Enjoy dinner with Apsara dance show. Enjoy breakfast at the hotel and then drive to Toul Sleng museum (S-21) and the killing field of Choueng Ek, which is about 35kim away from the city. These places are grim reminders of Cambodia's bloody past under Pol Pot. It is almost inconceivable to confront the nature of true evil here in this gentle land, but the Buddhist memorial at Choeung Ek, commemorates the 1.7 million victims of the 1975-79 Pol Pot regime. This excursion may prove distressing for some. Back to the city in the afternoon and visit Wat Phnom ( Central of the City): is a treasured place of respect for all Khmers and is the namesake of the capital. You have free time for shopping at the Russian Market called “Psha Toul Tom Poung”.Like the Central Market, there are several jewelers and gold-sellers, but it also carries huge selection of curios, silks and carvings, it is one of the best markets in town to buy fabric. 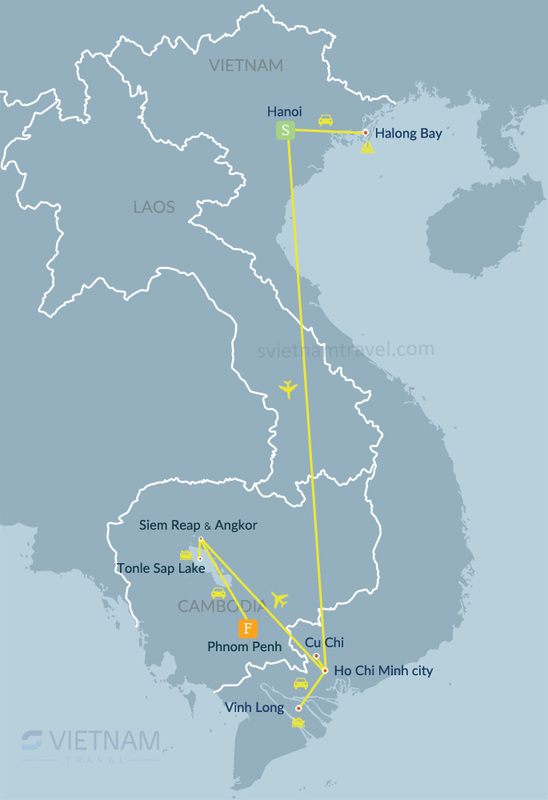 Flight tickets Hanoi - Saigon, Saigon - Siem Reap.